Some people have mentioned the notion that this is probably what a more "realistic" take of a Black Widow (Marvel) movie would be like. And I get why they'd say that. It is a similar concept - a Russian female ballerina who joined a secret program to turn them into a spy. But while I get the appeal of the film, I am not that intrigued by this particular film. And I am sad to say this, but while I know that Jennifer Lawrence is one of the best actress alive, I am already bored of her characters and performances. I am very much curious about this film, but I don't really understand much about it, so I am not exactly very excited. The trailers show some enticing visuals, but I don't understand what I see so I have doubts on the story itself. But if it turns out to be good, this could really be one of the surprise hits of the year. I find it a little tricky to place this film in my mind. On one hand, the film looks promising and I think it could be a good, fun adventure film. However, as I am such a big fan of the recent (reboot) Tomb Raider video games, there comes the feeling where I have my definitive Lara Croft (performed by Camilla Luddington) and I don't exactly need a Tomb Raider movie because even the stories in those games are already very good. But I do get the idea that this film opens up opportunities for further financial gains, and movies are more widely accessible to the public audience, as compared to the gaming community. So perhaps I will go into this film with a mindset of hoping to enjoy a nice adventure flick, but I might not associate this with the Lara Croft I know in the video games. I still don't think that the original Pacific Rim was a great movie, especially from a story perspective. But there is just something to like about it, and it is really an enjoyable film. It had excellent characters, and watching it again recently, it actually had excellent visual effects and it looked so real. A Guillermo Del Toro directed film will never look bad (and by the way, his recent film The Shape of Water just won the Oscar, so well done to him for that). Now, on Pacific Rim Uprising, it almost looks like it lost everything that made the first film great. The characters in this sequel looks shallow and over-the-top, and the actions & visual effects (from the trailers) looks rather fake & cheap. The first film wasn't great, but it was done with great heart & effort. This one just looks bad and uninteresting. I hope I'm wrong, but that is my impression of this film so far. A Steven Spielberg directed science-fiction film will always be up there in my to-watch list. 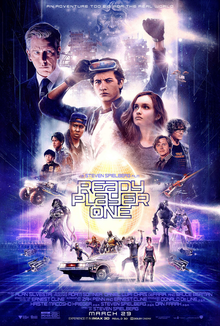 Add to that the brilliant cast and the promising story from the novel by Ernest Cline and also (hopefully) a memorable score/soundtrack by Alan Silvestri. But there is something more that excites me beyond all those, and that would be all the possible Easter Egg references and inclusions which ranges from 80s pop culture (like Back to the Future) to comic book characters to the video game world (like Tomb Raider, Street Fighter) and even more modern ones (like Overwatch). These are probably less significant when it comes to the story, but it just adds another level of excitement to the movie itself. In March 2, an action film titled Death Wish (https://www.youtube.com/watch?v=WkVCA0LDhwI) was released. Unfortunately, it looked like many other generic action flicks, and it stars Bruce Willis (whom I haven't seen in a good movie for a while). Worse still, the reviews from critics aren't that good. Then, on March 9, we have the action-comedy flick Gringo (https://www.youtube.com/watch?v=7-bZLM3I-C0) and also a disaster-action movie called The Hurricane Heist (https://www.youtube.com/watch?v=56whWF2NJrM). The latter film looks a bit too exaggerated and it does not appeal to me at all. On the other hand, Gringo is a film that I never knew about, but the trailer made me interested. It looks fun. Finally, as we near Easter, we see the release of both Paul, Apostle of Christ (https://www.youtube.com/watch?v=LyOqQZUDdO4) and Sherlock Gnomes (https://www.youtube.com/watch?v=zC9b1orltc8) on March 23rd. The first is, as the title suggests, a biblical story adaptation - smartly playing off the Easter season - while the other film is an animation flick which looks pretty interesting and boasts a pretty awesome voice cast.